Today we will be talking about different types of outdoor cabling. In this article we will be discussing both outdoor-rated and direct burial cables, what kind of installations they are used for and how they are different. We will also be going over how different outdoor cables are constructed. What is an outdoor-rated cable? This type of cable can be used when an installation requires that a cable be run outside, as normal cables are not designed to withstand nature's elements. Indoor cables are usually constructed with regular PVC (Polyvinyl chloride) jackets that offer no UV (ultraviolet) protection, and their brittle jackets can easily crack in direct sunlight and degrade over time. Direct burial cables differ from outdoor-rated cables in the way that they are designed to be buried under dirt, without the use of conduit. What is conduit? This is plastic or metal tubing that will protect a cable from the elements. Although all cables have a temperature rating, this is especially important when it comes to outdoor-rated and direct burial cable. Because these types of cables are designed to withstand heat and cold, they require more rigorous protection than normal cables. For cables that are going to be installed in colder climates, a cable with an outdoor-rated PE (Polyethylene) jacket is suggested. PE jackets are made from a semi-crystalline thermoplastic material which makes them perfect for withstanding lower temperatures. A regular PVC jacket can only support temperatures down to -20℃, where a Polyethylene jacket can support temperatures down to -40℃. Outdoor-rated cables are differentiated by their UV-resistant jackets. These types of cables are designed to be used outside, but not buried. Outdoor-rated cables are made to withstand heat and UV rays, and their UV-resistant jackets are either made out of PE or a UV-resistant PVC material. Technically outdoor-rated cables can be buried, as long as conduit is used. Keep in mind however that direct burial cables are designed specifically for this purpose. 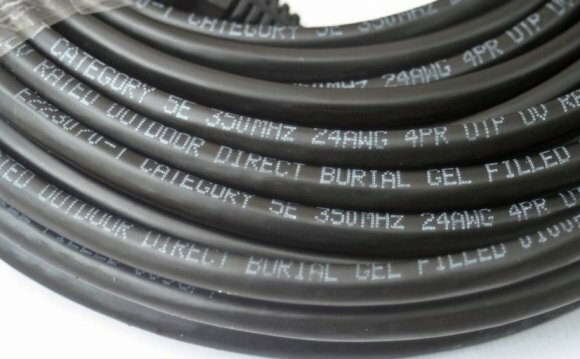 Direct burial cables can also have an outdoor-rated PVC jacket covering their internal wiring, but internally they are constructed much differently than an outdoor-rated cable. Direct burial cables are designed to be buried, just like their name suggests. Moisture is always a threat when cables are exposed to the elements. Waterproofing the cables helps prevent moisture damage. There are a few different styles of direct burial-type cable to choose from, and they are differentiated by the internal materials used to construct them. The first type has a waterproof gel inside that oozes into cracks and crevices which keep the internal wires coated, which prevents water getting through to them and causing damage. The second type has a waterproof tape that covers the internal wiring, which protects the cable from water and moisture. The third type is usually found on shielded cable, and has the internal wires wrapped with a PET tape, which uses a material that is similar to polyester. Mylar tape is then applied around the PET tape to add shielding to the cables. The tape versions of direct burial cable tend to be less of a mess to work with, as there is no gel oozing out of the cable ends. Some direct burial cables also feature a special built-in armor for rodent protection, so that rodents are not able to chew through the cables once they are buried in the ground. Direct burial cables are much stiffer than indoor cables, as they are usually built with splines inside to reinforce their center so that they are not easily crushed.